I know this will be an unusual post for me,since I have very few high end polishes. 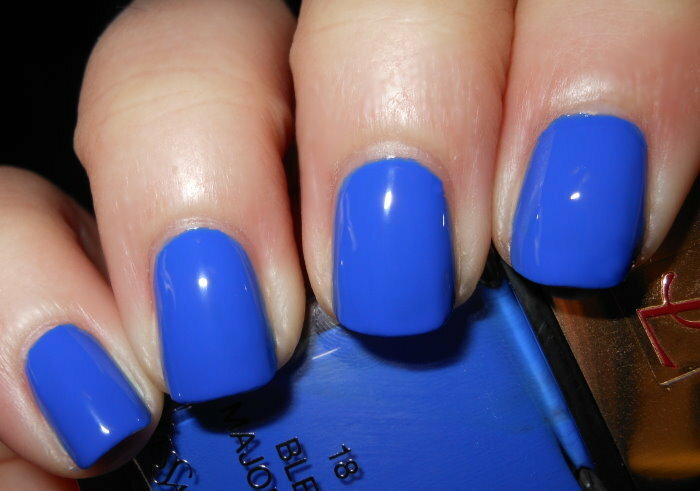 While at the CF Beauty Bloggers event at Neiman Marcus event a few weeks ago, I saw the beauty rep. from Yves Saint Laurent wearing this blue polish from their line. The first thing I said to her after her presentations was that I was coming back to buy that polish, and I did just that. I'm still in my bright blue phase, so I couldn't pass this up. It's not everyday I'd throw down $25 for a nail polish, but I happily did for this one. Bleu Majorelle is a bright cobalt blue creme. This polish is positively perfect in every way. The color is to die for. This is that bright blue I've been needing in my life. It is very vivid and pigmented. It really has a brightness to it unlike any other blue I've seen. The formula and application of this polish was great. It had a thin flat brush, which I really liked. I found out this color was inspired by the Majorelle Garden, designed by Jacques Majorelle in Marrakech, Morocco in the 20's and 30's. This shade of blue is used throughout the garden and the color was named after Majorelle himself. I'm a history buff, so to have a tidbit of history with the nail polish is very cool. I really love this color despite its hefty price tag. It was very worth it to me. I've found my high end polishes to continue to impress me. That being said, I will still not frequently shop high end brands. I certainly don't have the budget for it, but on the rare occasion for a special polish I'll give in! I'm in love (again like every time I see this kind of blue) - it's absolutely gorgeous! Oh gosh, I love this blue! I have been absolutely addicted to blue cremes lately, but alas... $25! OMG! I love this! It's absolutely gorgeous, and looks so creamy. This is absolutely gorgeous!!!!! Love it! What a perfect blue! Sometimes the high end polishes are well worth it. yesss i can't get enough of these bright blues.. need this!! love the inspiration. Wow, that is a gorgeous blue. How do you think it compares to Nails Inc Baker St? Thanks for sharing. That is so beautiful! Dang. Lemming fix needed. That's a great question. I'm curious about that too, but I don't have Baker St. I'm hoping to get it sometimes soon, so if I do I will do a comparison. Bought this shade yesterday.. And was shocked to see that the price is even stiffer here. Had to pay $ 32 for it. But by the look of this swatch, its totally worth it. Wow, this is such a beautiful blue! I tend to stay away from high end polishes but sometimes the high price is worth it. Hopefully this is similar to Nails Inc Baker Street, which I have and love. This is a gorgeous color! And thanks for the history tidbit-- how fascinating!